Thanks to Seth Godin’s post >>> today morning I have been blessed with reading one of the most “super cool” interviews ever. It featured David Horvath in it. Mind – blowing, breath-taking, down-to-earth story of one’s dream in action. See David's work here. 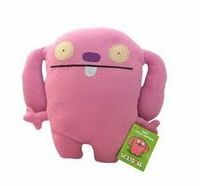 "Uglydolls"
Taking the same path as some one else did, results in getting close but never where you want to end up. Ignoring those paths and making up your own route leads you to where you really belong, wherever may it be. Your thoughts absolutely determines your reality. How you generally feel inside and what thoughts you generally carry in your head is what’s going to keep coming at you. “Real-job” with co-workers wanting to hang out and drink late hours weekends and comfortable money coming in is a dream killer. Get as much input as you can, then don’t follow any of it. The real failure is not starting. So I don’t fail. When you are afraid you are on a right path. Be what losers call a “loser”. Avoid all drugs, late week nights out. Be what losers call a “loser”. Stay home and make stuff for other people. Avoid the “scene” and hanging out with top artist in them. If you live rock-roll lifestyle, you get your photos in the back of magazine, only you and your buddies read, not much else. Making a lot of money costs a lot of money. Don’t reveal your plan to anyone! Tell us what you did, not what your are going to do! When you let fear take over for too long. You begin to hate seeing others get theirs done. I am truly grateful that there are people like David in this planet, who didn’t let their dreams and talent to go down the drain in order to fit it. Against all odds and hurdles, David is taking extraordinary creative unique authentic route of his own. Hats off and bowing. You are truly an inspiration David. David, thank you for your art. Thank you that YOU ARE. « [Video] Are you ready for spring? I’m not surprised he can pass that message given the story he has. Thank you for the bullet points Ivana. Inspiration supports us as we carve our path, shift our energies, and assert change. Let us seize each day. I can’t wait for the part where I can tell the world what I did… one day at a time, enjoying the journey. Thanks for the summary and the link Ivana. Hi Scott! ;-) Thank you so much for your 1st comment! I cannot wait either to hear your story! Till then keep on spreading light and love on your journey.